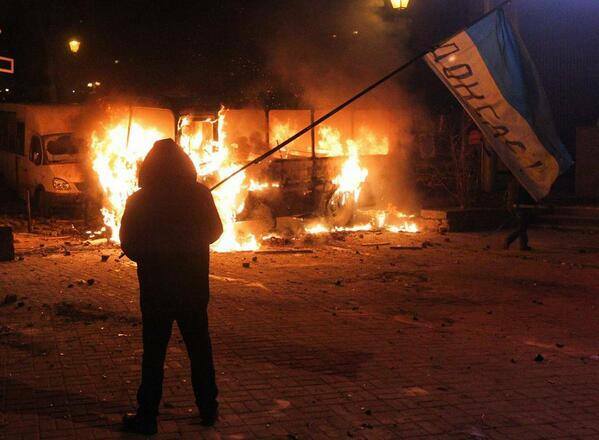 Months-long protests in Kyiv boiled over on Sunday night as an opposition gathering degenerated into violence. Josh Black argues that President Victor Yanukovych is fast losing the trust of his citizens. Sunday saw yet another rally of 100,000 plus protestors, but far worse violence than at any point since Euromaidan began in November of last year. Those who gathered in Kyiv had their frustrations reinforced by the passing earlier in the week of a series of laws designed to help facilitate a legal crackdown on the protest rallies and tent city on Kyiv’s Independence Square, yet jokey symbolism such as wearing colanders and saucepans to oppose a ban on helmets degenerated into acts of violence against police officers. News agencies largely agreed that the security forces were not responsible for provoking the violence and showed restraint, despite the use of rubber bullets and water cannons (in temperatures below freezing, which is reportedly illegal in Ukraine) to control the crowds. Nonetheless, the public perception of President Yanukovych’s government is souring from contempt to rage, and only he can repair the damage. Consider the twists and turns of the protest movement. People first started gathering on Independence Square in protest at the government’s decision to abandon talks with the European Union over a free trade pact. Despite large numbers showing up, Yanukovych flew to Moscow and agreed a $15 billion loan from Russia that many speculate will require Ukraine to join President Putin’s flagship trade group in return. While the political opposition organised but failed to win a confidence vote in parliament, the dying protests on the streets were reinvigorated by riot police attempting to forcibly clear Independence Square. Many young Ukrainians were injured in the process, and crowds responded by turning out in greater numbers and building barricades. In a bid to personalise the protests, some opposition figures arranged a march on the president’s private residence, 10 km from a suburban Kyiv metro station. The administration responded this week by banning motorcades involving more than five vehicles, and a prominent opposition figure has accused Yanukovych of being behind a horrific assault just before Christmas. As a result of these events, protesters are not inclined to trust the authorities to guarantee their right to assemble peacefully. Yesterday’s violence took place against a backdrop of rumour and innuendo on social media that the president was ordering in armoured vehicles to forcibly disperse protestors. Water cannons were met with petrol bombs and police beaten with sticks. Вікторе Януковичу! Не повторюйте шлях Чаушеску та Каддафі, припинить війну проти громадян України! The leaders of the opposition – and none are so influential that they are not in some senses followers themselves – have not coordinated their response. Vitali Klitschko, a former boxer and leader of the UDAR party who is contesting his disqualification from standing in the 2015 presidential election, was invited to meet with the president and attempted to calm protestors on Independence Square, comparing the situation to Bucharest in 1989 and Libya in 2011 (see above tweet). Oleh Tyhanibok, a firebrand nationalist whose Svoboda party has regained momentum through high-profile interventions in the protests (including the downfall of a statue of Lenin in Kyiv), said of the repressive laws passed last week that “we have a right not to carry them out and we will sabotage them.” Arseniy Yatsenyiuk, a clever operator but uncharismatic figure, said negotiations would start on Monday. As a result, Ukraine’s protests create a serious problem of legitimacy for the government, and one made more serious by the fact that many in Ukraine do not share the goals of the protestors. In the long term, anger can only be defused by better, less corrupt government and more transparency in the president’s international dealings. In the short term, the president must regain the trust of protestors by guaranteeing their rights to assemble and repealing repressive legislation. At best, that would return the protests to a stalemate, leaving a dangerous potential for frustrations to boil over. The opposition has so far struggled to agree on a common candidate for presidential elections next year. This will make agreeing the goals and direction of the protests harder than it needs to be. Yet the real reason for Yanukovych’s sense of invulnerability is that parliament is currently unflappable, with the coercive measures of last week passed by show of hands. To help make Ukraine’s democracy stronger, parliamentary elections should be held as close to presidential ones as possible. Ideally, both should be held this year, providing a referendum on Yanukovych. If not, 2015 may provide an end point for the protestors and allow Yanukovych a convenient escape from the ever more tense situation in his country. Tags: Euromaidan, Svoboda, Ukraine, Victor Yanukovych, Vitali Klitschko. Bookmark the permalink.